SMaRT Venue offers a range of delicious, freshly prepared food as well as hot and cold drinks. Whether you want to tuck into our All Day, Every Day Full English Breakfast or jacket potatoes or select from our healthy but appetising salad boxes, we have something for you. Or why not pop in for a coffee and cake? Download our full menu of food and drink. 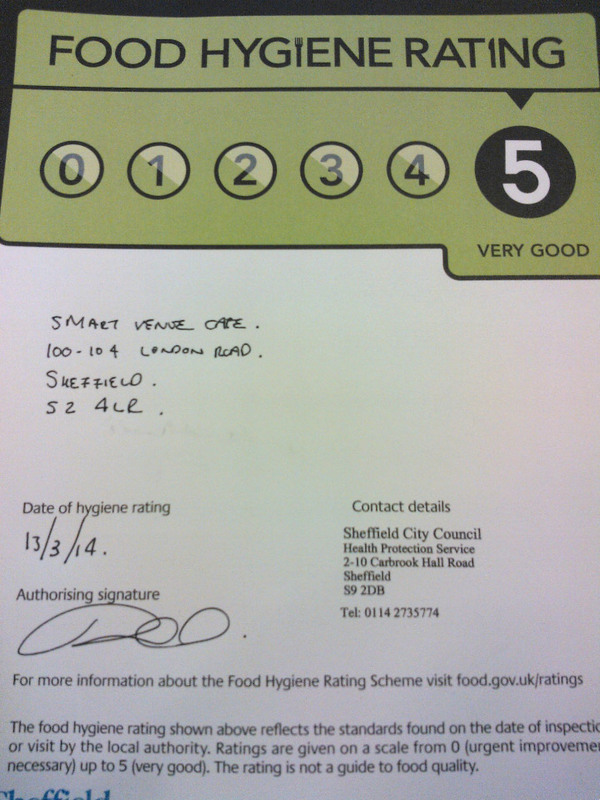 SMaRT Venue Coffee has been awarded a 5 star food hygiene rating for 2014. All offers from SMaRT Venue Coffee, are subject to the following terms and conditions. Errors and omissions excepted. Offers are subject to availability and may be withdrawn at any time regardless of a published ‘valid until’ date. If you require more information about the Terms and Conditions relating to the offer you are interested in, contact SMaRT Venue Coffee. 100 London Road, Sheffield, S2 4LR. Peruse our menu then give us a call on 0114 281 2981. Ask us about local delivery.